This is wrong, so don't try it at home, but also kind of funny. Although the Texas Department of Transportation isn't laughing. Someone yesterday hacked into a digital traffic sign in Austin that was placed to warn drivers of detours. They changed the messages to say things like, "Caution! 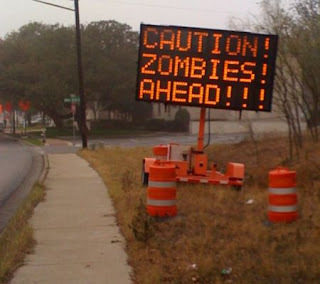 Zombies Ahead," "Nazi Zombies! Run!! !, and "Run for cold climates." Traffic controllers say the signs generated safety hazards thanks to drivers slowing down to view the messages and take photos. TxDOT is trying to figure out who hacked into its digital road sign system. The sign manufacturing company had to be brought in to override the hacker's work. There is good news though; no zombies have been sighted in the area. 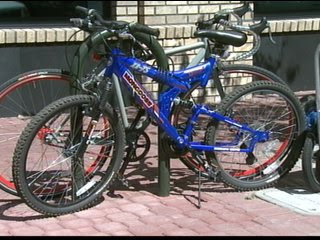 Today is the day to weigh in with your bike and pedestrian suggestions to the Idaho Transportation Department's Bike and Pedestrian Coordinator. Between 12:30 and 2:30 p.m. today you can stop by Coeur d'Alene City Hall, 701 E. Mullan, on the second floor to provide input on the importance of non-motorized transportation at local, regional and state levels. The input received will help identify a preferred vision for non-motorized mobility statewide. Similar discussions have been held in Idaho Falls, Driggs, Pocatello, and Lewiston. Earlier this week I blogged about the glut of roadkill I've been seeing along area roads recently. The Idaho Transportation Department and Idaho Fish and Game Department have teamed up to do something about it. They've developed the 'Idaho Highway Wildlife Web' site to both warn motorists of wildlife corridors and to track game sightings. 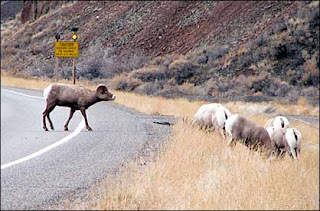 The site also allows motorists to report where and when they see wildlife on the road. The Web uses a Google map to show wildlife corridors, a description of the types of wildlife that cross there, and how many incidents have been reported. The House today approved President Obama's $819 billion stimulus bill, meaning it moves onto the Senate now. Here's the story. And if you want to know what road and transit projects the North Idaho is hoping to get out of the stimulus package, Here's the list. Remember when I blogged about the large amount of roadkill lately? Well I was referring to deer, skunks, raccoons, and the occasional moose. A Mt. Vernon, Ill. man hit something a lot bigger though. This mountain lion allegedly weighed 260 pounds. Most mature male mountain lions supposedly weight between 80 and 150 pounds, so that's a big cat. Must have made a big dent in his car too. President Obama yesterday addressed the ailing auto industry, telling them to accept tougher standards on how much fuel vehicles use. In return, the government will consider helping to find money to meet those standards. Obama ordered his administration to reconsider rules by California to limit greenhouse gas emissions from new cars and trucks. Here's the story from the Spokesman-Review. Record Crowds Fill D.C. For Inauguration With No Traffic Snarls. How Did That Happen? Thanks to poster 'mjking' who provided this very interesting link. It's about how all bridges into downtown Washington, D.C. were closed for Inauguration Day last Tuesday. But the amazing part is that it didn't lead to a complete breakdown of the transportation system, it actually made it work better! On an average day, 400,000 commuters enter downtown DC. Last Tuesday, 1.8 million people did, and with very few traffic snarls or accidents. So why did everything flow so smoothly despite the huge number of people trying to get around? No commuters in single-passenger cars. Read the story (and the comments following it are interesting too) and tell us what you think. This is your chance to weigh in on an opportunity to make the State of Idaho more pedestrian and bike friendly. The next stop for a series of bicycle and pedestrian mobility discussion will be in Coeur d'Alene this Thursday, Jan. 29. The session will be held at City Hall Old Council Chambers, 701 E. Mullan, Second Floor. It will be an open-house style forum; so anyone interested can come at anytime between 12:30 and 2:30 p.m.
Idaho Transportation Department's Bike and Pedestrian Coordinator will be on hand at the meeting to get input from you on the importance of non-motorized transportation at local, regional and state levels. The input received will help identify a preferred vision for non-motorized mobility statewide. Similar discussions were held in Idaho Falls, Driggs, Pocatello, and Lewiston. The Idaho Transportation Department wants to remind you that you only have a few more days to give your opinion on how to improve non-motorized transportation in Idaho. The last day to take an ITD survey on the subject is Jan. 31. 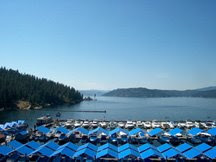 The Coeur d'Alene Press has more information on the survey. And by the way, KMPO is starting work on a Non-Motorized Plan for Kootenai County, and will also be issuing a survey in the coming months, but on a local level. So check back, we'll keep you updated. I think you would find that this would not be feasible for the city of Coeur d'Alene. Several factors involved in this reasoning. 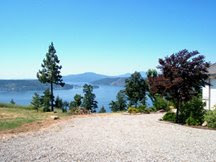 The city of Coeur d’Alene contract to Waste Management for the curb or alleyway pickup for refuse and recyclable goods. With that process we would have to coordinate with them so we could use our “State of the Art” loaders with gates on the plows. This allows us to reduce the size of the berms in driveways. By coordinating this effort, I believe snow service would be reduced as we would be limited to only being able to plow where these routes were for that given day. If I were to look into the city of Detroit and New York’s snow plan I would imagine that they did not plow residential areas. I did look up their respective annual amount of snow and they are meager I compared to what we receive. Less than 35 inches. There was a letter to the editor in yesterday's Spokesman-Review (which I can't find now) about how the cities of New York and Detroit attach plows to the front of garbage trucks when they have storms. The trucks plow their way to each garbage stop, killing two birds with one stone. Very interesting, but how feasible is that for North Idaho? I contacted the City Street Department to ask, but probably won't hear back until tomorrow since the City is closed for the holiday. I'll give an update when I know more. The Idaho Transportation Board, met this morning in Boise, and voted to put the Dover Bridge and another project back on economic stimulus list. Here's the story. And if you're interested in the list of proposed economic stimulus projects for Kootenai County, here's the list and more info. No plans for Sunday night? Do something fun while helping out local trails. The Banff Mountain Film Festival World Tour will be shown at the Coeur d’Alene Resort Convention Center on January 25 starting at 6:00 p.m. Proceeds go to support the North Idaho Centennial Trail Foundation as well as The Satipo Kids Project located in Satipo, Peru. Tickets are $10.00 in advance and $12.00at the door. They're available at Vertical Earth and the Camera Corral in downtown Coeur d’Alene as well as all area Zip’s Drive-ins in Coeur d’Alene, Post Falls, Rathdrum, and Hayden. Eight films will be shown including 'Journey to the Center' about BASE jumpers on a 10,000 mile cultural exploration of China, 'Crux,' about some pretty fearless snowboarders, and other films about kayaking, backcountry skiing, and bicycling. For more information, call North Idaho Centennial Trail Foundation Manager Charlie Miller at 208-292-1634. The fighting over the Sand Creek Byway continues. This time a developer is accusing the Idaho Transportation Department of civil rights violations. The Bonner County Daily Bee has the story. Will Chrysler fans soon be driving Italian cars? It could happen... Fiat and Chrysler are forming an alliance that would give the Italian auto empire a 35% stake in the U.S. carmaker and could eventually bring it full control.Here's the partnership details. Interstates 90 and 94 function as major corridors for commercial and recreational travel. Washington, Idaho, Montana, Wyoming, North Dakota, South Dakota, Minnesota, and Wisconsin are predominantly rural and face similar transportation issues related to traffic management, traveler information, and commercial vehicle operations. The states have pooled their resources to develop the corridor-wide Web site; providing traveler information at one easy location. Here's a link to check it out. An audit of the Idaho Transportation Department says the agency could save money by improving management practices, and by maintaining roads and bridges better. Here's the story from the Spokesman-Review. Oil Prices Are Down, Gas Is Up- What's The Story? Oil prices are down, but gas prices are up. How does that work?The Spokesman-Review has some questions and answers about the connections between oil and gasoline prices. It may have been beautiful, but the snow last month was dangerous. The number of car accidents in the city jumped more than 100 percent in December, costing almost half a million dollars in damage, according to a monthly report the Coeur d'Alene Police released this week. Accidents increased from 49 to 104 between November and December, with the number of hit and runs jumping from 13 to 35. Here are more statistics. Should Drivers Be Fined Who Don't Use Handsfree Devices? The subject has been brought up again as to whether drivers who text or talk on cell phones without a handsfree unit should be fined in Idaho. This time it's the Idaho Statesman asking the questionin this article. Now, the Spokesman-Review is taking an informal poll on the subject.Click here to give your opinion. You've heard a lot about local plow drivers who worked ridiculously long days for weeks straight during this year's snow storms. But you haven't heard much about what it takes to keep those drivers' plows and graders going. The Coeur d'Alene Press introduces us to Dennis Desmarais, Coeur d'Alene's street maintenance shop supervisor. The big topic lately has been president-elect Barack Obama’s proposed economic stimulus package. The package is a $800+ billion package aimed at funding the construction of infrastructure such as roads, highways, transit and bike and pedestrian projects, in an effort to stimulate the economy. KMPO worked with local transportation agencies on a list of projects to submit for possible stimulus funding. Here's a link to more info on the Stimulus Package and the list of proposed projects for Kootenai County. Any questions? Jeff is the authority on this. As much of an authority as you can be when you have limited information, anyway. Speed Control Method Or Crafty Advertising Device? These pictures were emailed to me by our accountant who thought they were interesting, as the text that accompanied them claims 'This is actually a speed control device that is in use.' Turning to the trusty internet, I was not able to find any evidence that they're actual speed control devices. Plus, the writing on the picture that says 'Feels like Pioneer Suspension' leads me to believe that they're an ad for Pioneer brand shocks. Either way, they're a funny idea, but can you imagine the liability agencies would face from the people who would try to avoid falling into one of these 'holes' and sideswipe another car in the process? On the other hand, I've talked to people recently who actually claim to have seen potholes this big in our area. Starting this month, people who ride their bike to work can get a federal tax break for doing so. The credit was among a range of energy and tax provisions quickly added to the $700 billion financial rescue in November. Here are the details from the New York Times. If you don't already ride your bike to work but have been considering doing so, will this encourage you to do so? Citylink has released it's latest numbers, and they show a drop in riders for December. Citylink officials say they're not too surprised; the bad weather kept a lot of people home or in their own cars so they didn't have to stand in snow-choked streets to catch the bus. Also, lower gas prices have a lot of people driving themselves again. Here are the numbers. Gas prices have already started going back up in Spokane, but remain low in Coeur d'Alene. A couple weeks ago I got gas for as low as $1.45 a gallon in Spokane. Now it's up to $1.59 at a lot of Spokane stations. Prices have remained low in Coeur d'Alene though, with one person telling me they got gas for $1.35 this week! Analysts say don't get used to it though. Here's the Coeur d'Alene Press story. Here's an interesting Youtube video on the history of the Model T. The part that I found interesting is toward the end where it talks about how cities were just starting to develop infrastructure at the time of the Model T, and there were few roads and the ones that did exist were rough to say the least. Because of that, the Model T was built to withstand everything. Guess you could call it the predecessor to the Hummer. Construction on an I90 interchange on the west side of Post Falls is expected to start this fall. The interchange, in the area of Beck Road between State Line and Pleasant View interchanges, is expected to spur on development such as Wal-Mart and Lowe's at The Pointe at Post Falls. Transportation officials believe retailers and hotels are waiting for I-90 access before signing on. Here's the Coeur d'Alene Press story. There are a lot of people dreading Idaho's upcoming legislative session. With state revenues slipping, budget cuts, and the governor’s effort to boost transportation funding, things are looking bleak. Governor Otter says he knows he's got an uphill battle ahead of him, but it's necessary since our roads are falling apart. Here's the Spokesman-Review story. Area roads are finally getting cleaned up, but most area sidewalks are still impassable, especially after repeated thawing and freezing of snow pushed onto the sidewalks by plows. Local officials say there's nothing they can do though, besides asking residents to shovel sidewalks in front of their house. Officials in other cities take a different approach though. Here's what other jurisdictions are doing to keep their sidewalks clear. The Idaho Statesman is putting in their two cents regarding the Idaho Transportation Board's short shrift of the Dover Bridge for possible stimulus package money. Here's an editorial that ran in the Statesman today. Both east and westbound lanes of I-90 are now open to all traffic. However, due to erosion & some undermining of the shoulders, drivers must stay off the shoulders of I-90. Do not drive, stop or park on the shoulders of I-90 between North Bend & Easton. Here are some crazy pictures from Snoqualmie Pass that show why you couldn't use it prior to this morning. The Washington State Department Of Transportation is also working to open I-5 from 11miles south of Chehalis to about 20 miles south of Olympia. In the meantime, the closures have caused thousands of truckers to cool their heels on either side of the pass, causing area shortages on things like snow tires, snow chains, snow shovels and de-icer as well as a few types of groceries.Here's the story from the Spokesman-Review. An editorial in the Spokesman-Review today says that drivers don't take the law banning the use of hand-held cell phones while driving seriously. Here's the story. Now, the Spokesman's 'Huckleberries' blog is asking if Idaho should ban the use of hand-held cell phones while driving and/or should such an offense be a primary rather than secondary one? Click here to weigh in with your opinion. 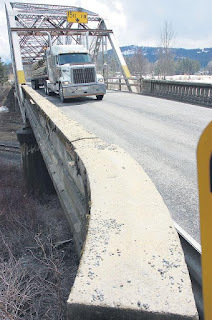 Idaho’s Transportation Board - faced with a staff recommendation to make replacement of the deterioriated Dover Bridge its top priority for federal stimulus funds - instead dropped the project to No. 7 on its list in a special meeting yesterday. And the news gets worse; only six projects are likely to get funded. Now, North Idaho Sen. Shawn Keough and Governor Butch Otter are not happy. Here's the story from the Spokesman-Review. Congratulations North Idaho, you're the recipient of a whole mess of precipitation! According to the National Weather Service, north Idaho, not eastern Washington, is seeing the brunt of the recent rain and melt-off. According to meteorologist John Fox, flood warnings have been issued for the Coeur d’Alene River in Cataldo and the Palouse River, and there are ice jams in the St. Joe River. While Coeur d’Alene had less than an inch of rain, the Northern Panhandle had anywhere from 1 to 4 inches. The cold weather expected tonight will help to slow the rapid runoff into the rivers though. 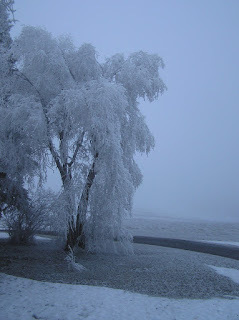 Temperatures are expected to drop throughout the day into the 20s tonight. Of course, that will turn all the standing water into a sheet of ice. approve a Cyclist’s Bill of Rights! It still has some hoops to jump through (the Cyclists’ Bill of Rights will be forwarded to the Los Angeles Department of Transportation, Planning Department, Department of Public Works, and Los Angeles Bicycle Advisory Committee to report with recommendations on how to incorporate the principles into the City of Los Angeles Bicycle Master Plan and other relevant documents)but this is a big first step. Here's a look at L.A.'s 'Cyclists Bill of Rights. Who's Responsible For Plowing What? - The Idaho Transportation Department (ITD) is responsible for state highways and interstates. Anything with the words 'highway,' 'state route,' 'or 'I' (as in I90) are within ITD's jurisdiction. - When a major state highway, like Highway 95, runs through a city, it is still the responsibility of ITD to plow it. - Highway Districts are responsible for roads outside city limits. There are four highway districts in Kootenai County: Lakes, Post Falls, Eastside and Worley Highway Districts. Check your property tax statement to determine, which district you live in. - Cities are responsible for clearing all roads inside the city limits. - For those people who live in private developments, or gated communities, you are probably on your own. Many of these private developments have homeowners associations that assume those maintenance responsibilities. I've been hearing that a lot of agencies are getting complaints about snow removal, etc. for areas that are not within their jurisdiction. So maybe this will help. First though, take a deep breath and go to your happy place. Then make the call. To get your mind off snow, here's another somewhat 'unpleasant' driving item to discuss. Tomorrow is the US95 Access Study Open House. It will be at ITD from 5-7 p.m. (it's an open house format so you can come at anytime and leave at anytime), at 600 W. Prairie Ave. KMPO conducted the study to find ways to make US95 flow smoother, while making it safer and maintaining access to local businesses. Several recommendations came out of the study, including adding traffic lights at some intersections, removing them at others and restricting turns at some intersections. Here's the draft study report. The Spokemsan has an article in today's paper about the study and the meeting. Here it is. The Coeur d'Alene Press compares area roads to wagon trails, but in my opinion, they're still better than on the Washington side. Ruts, bumps, and narrow streets are just a few of the obstacles drivers are facing. Here's the Press story. I was snowed in all day yesterday, with no electricity. So I was pretty dang excited to find out this morning that a good samaritan had plowed the road. When I went to start up the car though, I found that all four doors were frozen shut. What to do, what to do? A quick search of the internet came up with several ideas, the best in my opinion was to use a hair dryer to thaw them. That worked perfectly. And to keep it from happening again, the internet told me to spray a bit of silicone spray (available at any auto parts store) onto an old rag and wipe it onto all the rubber gaskets around your car doors. I'll give it a shot. So problem solved. Once I got the car out though, I realized the front license plate was missing. Sigh... now to tackle that problem.